THE NUTCRACKER' is one of those enduring Yuletide confections that can get a bit stale if it isn't served up with a proper amount of spectacle. The key to a well-done production of this classic ballet is to enrapture both children and adults with lush sets, nimble dancing and the story of a precocious young girl being propelled into a magical world where toys come alive and dreams are real. Ballet San Jose once again conjures up a handsome production of this perennial Christmas favorite. A vision of iridescent fantasy, this production will be of interest even to people who have seen the Nutcracker more times then they care to mention. Dennis Nahat's rendering of The Nutcracker is coherent and light, beginning in a bustling 19th-century Viennese parlor and transported on a fantastical journey of worldwide travel. Gone are the traditional dancing bonbons, parading flowers and archetypal fairies, replaced by the dancing sovereigns and grand courts of China, Spain, Arabia, and Russia. 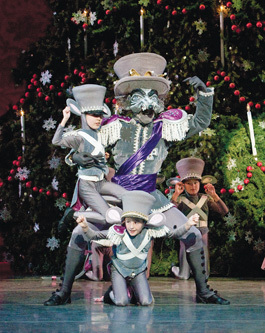 Pint-sized Maria Jacobs deftly dances as main character Maria, with muscular Ramon Moreno as her Nutcracker Prince (the roles are double cast and in some cases triple cast). Well matched in stature and skill, they surpass the rest of the dancers with their impressive stamina, on pointe footwork and tricky positions. In her childlike pink dress, Jacobs executed difficult series of pirouettes where she seemed to be suspended in time, displaying picture-perfect balance. Supported by the boldness and strength of Moreno, Jacobs also soared in effortless leaps, lifts and turns with grace. The ballet's battle scene between soldiers and mice was handled humorously, with the kinder of the San Jose Ballet playing a rodentia army. Pawing at the air while costumed in little gray mouse ears, the children were so adorable that the scene remained amusing despite cluttered choreography. Post-battle, snow flurries whitened the stage into a crystalline winter wonderland that was truly an enchanting sight to see. Dancing through the blizzard, the corps de ballet of snowflakes gave their all, though at times without perfect synchrony. The most strikingly beautiful performance was saved for the end, with the grand pas de deux of Jeremy Kovitch and Alexsandra Meijer, dancing as the Tsar and Tsarina of Russia. Both fluid and precise, Meijer is a gorgeous dancer who pirouetted and leapt around stage with aplomb. On opening night, she was a portrait of poise and graceful strength, starting out serious and expressionless as she performed meticulous leg lifts and dramatic dives into Kovitch's arms. Carrying out difficult move after move without flaw, Meijer began to beam at the audience with an energy and enthusiasm that was infectious. Maggie Heaman's costume design is storybook rich, with dancers dressed in frothy white tulle, ornamented ballroom gowns and twinkling tutus, making Maria and the Nutcracker Prince's voyage around their dream world truly a sumptuous visual feast. Reviews of new book releases. Reviews and previews of new plays, operas and symphony performances. Reviews and previews of new dance performances and events.